March 11th is the eve of St. Gregory’s day in Slovenia, a special celebration called Vuč u Vodo (luč v vodo in good Slovene) – which means “light in the water”, takes place in Tržič, a town near my home. Pope Gregory I, later known as St. Gregory the Great, was recognized for his talents in writing – one of his most famous works is the Gregorian chant. He was Pope from September 3rd 590 (his new Feast day since 1969) until his death on March 12th 604 (his old Feast day). In Slovenia, St. Gregory’s day, Gregorjevo is the Slovenian version of Valentine’s day – the day of lovers. 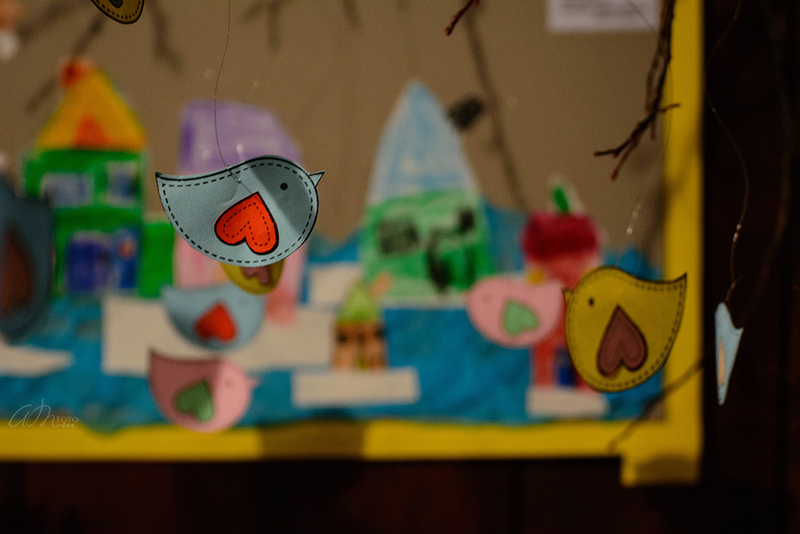 Old folktales told by grandmothers, babice, say that birds get married on March 12th and announce the arrival of spring. Bird is a symbol of love. Old beliefs say that on St. Gregory’s day, the first bird that an unmarried girl will see as she looks up the sky will tell her who her future husband will be. Believe it or not? For more than one hundred years, Vuč u Vodo has been celebrated in Tržič, the town of Shoemakers. Back in the days, when there was no electricity, special candles were used by shoemakers to light their workshops. As spring approaches, daylight gets longer and candles are no longer needed. The shoes-making apprentices were especially happy about it and to celebrate the longer day, they decided to clean the workshops, like a huge spring cleaning. Wooden shreds were place into small baskets, lit and put into the stream of Tržič Bistrica. Nowadays, there are not a lot of workshop to clean, but the tradition remains and is still celebrated. 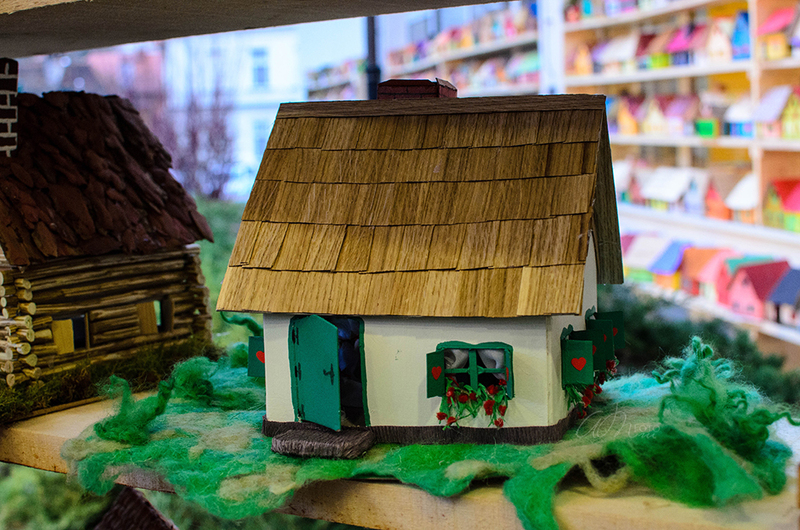 Every year, the kindergartens and schools in Tržič build many little houses as an important pedagogical activity. During the eve of Gregorjeva, everybody will gather in the old town, a parade will start toward Tržič Bistrica – parents and children, with their little houses in hand, will walk to the river, light the house (or the candle) and let it go in the water. 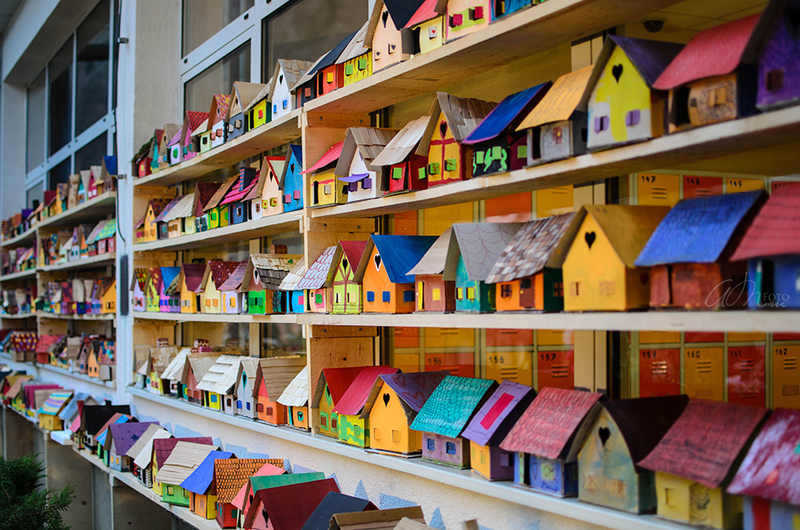 This year, Tržič tried to set Guinness Record: 950 houses were built for the occasion. Unfortunately, the event was considered too “local” and it didn’t met the requirement – still an absolutely beautiful sight to see! Vuč u Vodo is a great way to celebrate the (soon) arrival of spring. Another interesting festival in Slovenia is Pust, a parade that chased winter away. Those photos were taken in Tržič, during the holidays season – December 2014. These photos were taken in Dovžanova Soteska, Autumn 2014. 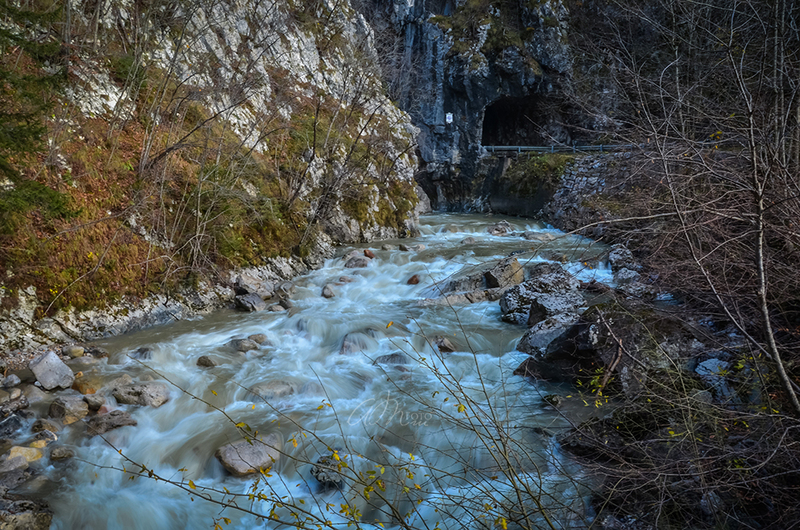 For hiking lovers, walking through the Dovžanova Soteska – Dovžan Gorge is a must. It’s situated near the town of Tržič and begins at the village of Čadovlje. Yesterday, we had a decent amount of sun, so we decided to do a small lazy Sunday walk in the Dovžanova Soteska. We walked, following the road till our favorite bakery Slaščičarstvo Cerkovnik, then turning left at the bridge. And there’s another historical site: Jamenšnikova domačija in Paštba. As the sign says, the Jamenšnikova domačija in Paštba is one of the very few preserved architecture of the Karavanke region in the surroundings. Its paštba – a small place that was used to dry linseed, hemp and fruits, is also the only one preserved around Tržič. We took the small path of the right side and made a small hike up. The paths follow the water flow of the Tržiška Bistrica nearby and gradually, lead us to better views of the mountains around. The rocks along the paths, known as Travis Breccia, are minerals that have been formed 267 millions years ago. You can easily be find and see them: they look like a conglomerate of round rocks. The Dovžanova Soteska is well-known for its geological path. 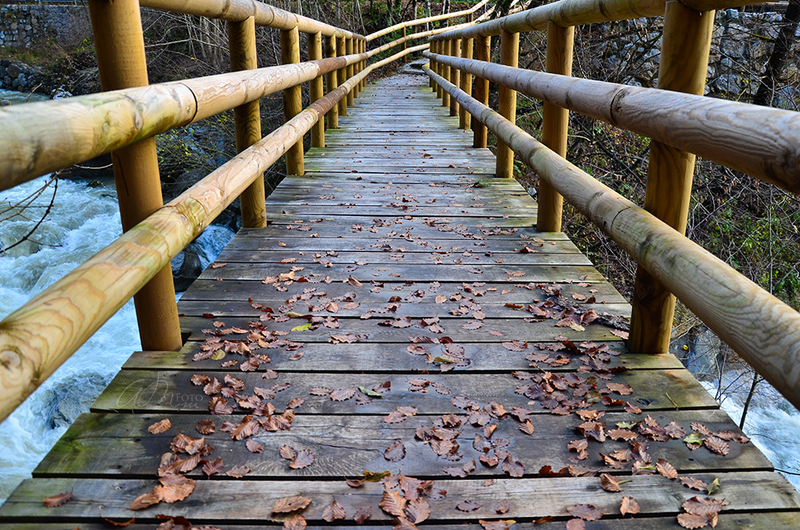 Walking up, taking pictures, breathing some fresh air, then we reached a beautiful wooden bridge, crossing over the Tržiška Bistrica and back to the main road. At the top right corner, you can see a glimpse of a famous tunnel that goes through the rocks (it’s a little scary to walk there, but it’s safe), the road lead to the village of Jelendol. Map and more information can be found on the Dovžanova Soteska Official Website (in Slovene). Thanks for accompanying me through my refreshing hike! More photos can be found in my Gallery. I currently live in a very small charming village called Čadovlje pri Tržiču, the closest town is about 10-30 mins walk downhills. Tržič is a small town of approximately 15.000 inhabitants, northern side of Slovenia, near the borders of Austria. One thing I absolutely like about Tržič is that it’s famous for its shoes industry- for a girl, this information is very important! The Tržič‘s museum has an interesting collections of different objects that are part of Tržič‘s tradesmen’s history. Shoesmaking, leatherworks, wheelcraftings exhibitions (and more) can be visited there. When I visited the museum, I was greeted by an nice English speaking guide – who also maintains the place. Peko shoes factory – a well known shoes brand through Europe, is situated in Tržič. Having a shoes factory in town means that the newest collection will be there first, the outlets sales will have the more choices of style and sizes. Peko also makes unique shoes model for fashion show and they sell them afterward at a very affordable price, usually size 37-38 (but that depends on the model’s size). I got a pretty, unique and all leather pair of shoes for only 20€! The outlet also have sales pretty often – imagine finding a pair of leather shoes that you will absolutely love for under 20€ – isn’t it just simply wonderful! Sometimes, the Peko outlet also sells their “defective B” shoes model at a fraction of the normal price. It’s worth visit Peko shoes factory once in a while! Updates June 2016 – I am sad to announce that the Peko Factory is now closed. In Slovenia, it’s part of the culture to offer a pair of slippers to guest when they visit you – not in our farmhouse but at least in most household. Brodi is famous for their slippers in Tržič. They make handcrafted leather slippers for toddlers who learns to walk, for children as play shoes in kindergarten and for adults to be worn in the house. They also make other leather products such as belt, wallet, pouches and bags. Once I saw a very original pair of sandals on their website, but when I got to the shop, they were sadly sold out. The owner then told me that he could make an unique pair, just for me, with customized size and colors if I wanted to. Guess what my answer was? Yes, please! The vision at Brodi is to create handmade slippers for every customer, because everyone is unique. If you pass by, you should go have a look – their patterns are very creative and special! Every year, on the first Sunday of September, there is a local fair in Tržič called Šuštarska Nedelja – the Shoemakers Sunday. Huge sales at Peko (and tons of people) and lots of small kiosks full of products on the streets and through the old town. The main street is closed to traffic – so it’s safe for kids. Some stands are cooking golaž – a traditional Slovenian stew. Usually, a mobile attraction park with games for kids is also there. Fairs are entertaining and fun – it is also a good way to discover traditional Slovenian products. If you’re nearby that day, be sure to walk around. Of course, Tržič is not all and just about shoes – there is also others point of interest worth checking. Dovžanova Soteska – The Dovžan Gorge, mineral and fossil’s hiking path. RIS Dolina – The Fossil Exhibition, a collection of all minerals and fossils in the Dovžan Gorge. Kurnikova Hiša – The Kurnik House, an architectural heritage of Slovenia right at the corner of one of Tržič‘s main street. Staro mestno jedro Tržiča – The Old City Core of Tržič, iron gates with rosettes can be admired. The last Curiosity Window can be seen on Koroški 1, which allowed women to peek outside without having to open the window. Memorial park Mauthausen, the only concentration camp in Slovenia. Tržič is a very small town – compared to Montreal, where I am from, but in term of history, Tržič indeed has more noticeable ones. If you decide to come by, let me know what you think about Tržič through the comment box!